The United Way Campaign finish line is in sight! With seven days left till touchdown, the campaign is at 84% of goal, with 16% to go! This final push is critical. 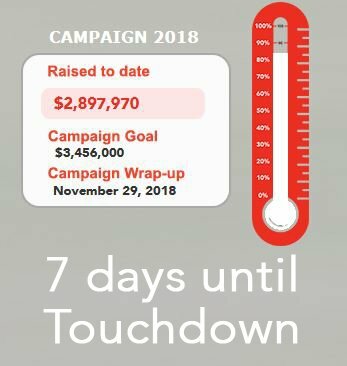 It is now time to get all of your totals, envelopes and donations in so your amazing efforts can contribute to moving the thermometer up to and past the goal. While the United Way takes money 365 days of the year, we want to make sure your donation contributes to the final total to be announced on the 29th of November. Call the United Way KFL&A office at 613 542 2674 or email campaign@unitedwaykfla.ca if you need a pick-up or have money to report. Call even if it is to simply let us know your donation is coming in the next few weeks. If you have workplace envelopes, call or email the United Way and our amazing sponsored employees will come by and pick them up. Thank you to all volunteers, workplaces, donors and supporters. We look forward to celebrating your achievements on November 29th at the Touchdown Breakfast.